Cathode catalyst layers in fuel cell technology consist of platinum nanoparticles embedded in a carbon matrix, Pt(C). If the carbon matrix in a film is diamond-like, the electron transport is dominated by tunneling between neighboring platinum particles. Consequently, the film is insulating at low platinum particle density. 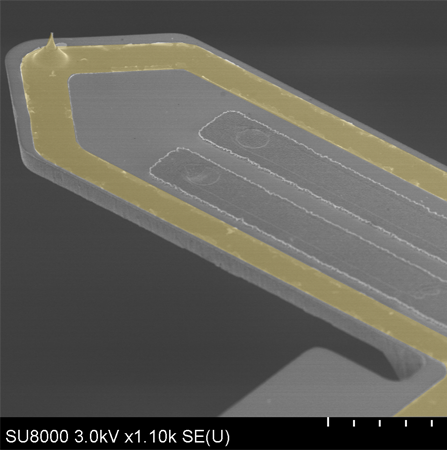 In an SEM these nanogranular films can be modified by focused electron beam induced processing (FEBIP). Upon electron beam irradiation carbon is oxidized by oxygen from residual water and released from the matrix. As a result, the matrix becomes more compact, thus reducing the distance between the metallic nanoparticles. At the same time, the structure of the carbon can be changed to a graphite-like structure, which is intrinsically conductive. Both the closer distance between Pt nanoparticles and the formation of graphite-like entities gradually increase the conductivity of a Pt(C) film. With AFSEM™ the gradual increase of conductivity can be studied directly between the irradiation steps, without sample transfer. Since the measurements are performed in the vacuum of the SEM, contamination issues that are generally encountered in air are reduced. 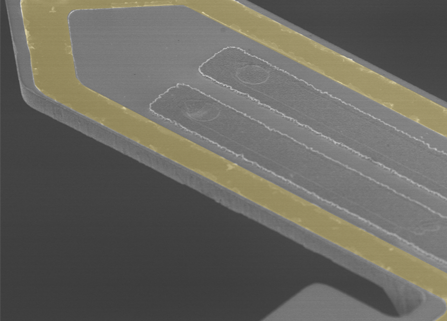 For such measurements the AFSEM™ works with conductive, self-sensing cantilevers with sharp, solid platinum tips. The platinum tips are grown by focused electron beam induced deposition. A gold lead connects the tip to a current amplifier. With AFSEM™ the gradual effect of the irradiation dose on topography and conductivity can be measured in-situ, without sample transfer. AFM topography of a Pt(C) film modified with FEBIP at different doses (left). The reduction of height shows the compacting of the film with irradiation dose. At the same time, an increase in local conductivity was observed at higher doses.